Revelation 13 mentions the number of the beast, and that number is 666. What exactly is this number? What does it represent? On this page we hope to clarify this issue that has been greatly confused in the world. 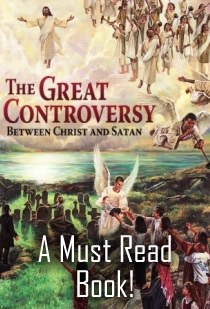 There is much confusion in the world today about 666, the number of the beast. Some believe that 666 is the actual mark of the beast, in the form of a bar code or tattoo. Some even believe that the number isn't 666, but 616 or 606. But Revelation 13 is very clear that the number is "six hundred threescore and six". Which is six hundred and sixty six. So straight away we can discard the belief that the number of the beast is anything other than 666. Now there is a very important point that the majority of people miss concerning the number 666, and that is the fact that 666 is a NUMBER that needs to be "calculated". As you can see, it says that we need "wisdom" and that we need to "calculate" the NUMBER of the beast. So what does this mean? It means that 666 cannot just be three digits that would appear on a barcode or tattoo. Niether does it mean that the digits 666 that may appear in a date or phone number or licence place is evil. In of themselves, the three digits of 666 together are not evil. This is an actual number that needs to be calculated. So other numbers need to be added together to arrive at the number 666. So to be able to calculate the number 666, we need to first find out who the beast is right? Because the number is the number of the beast. So logic tells us that we first need to know who the beast is. This is why we need "wisdom" to find out what this number is and who's number it is. The identity of the beast of Revelation 13, also known as the main end time antichrist system can be found in various places in the Bible. In Daniel 7, we find a little horn power that rises from the old Roman Empire, amongst the ten nations of Europe. This little horn power speaks great pompous words against the Most High God, and persecutes the saints of God throughout a period known as "the dark ages". Then in Revelation 13 we find a beast rising from the sea (which represents a kingdom rising from a populated area, see Revelation 17:15). If you take a look at the description of the beast, you will see it is an amalgamation of all the beasts from Daniel 7. So we are looking at a kingdom today that has many of the traditions and systems from those prior kingdoms of Babylon, Medo Persia, Greece and Rome. This beast also speaks great things against God and persecutes God's people during a specific time period. It reigns over and persecutes the people of God for the same amount of time that the little horn power does. In Revelation 17 we find a woman riding a beast. This woman is a "whore", known as the Whore of Babylon, (see here) who is guilty of committing fornication with the world and has also persecuted God's people. We see that the beast which the woman is riding is the same 7 headed beast as in Revelation 13. And what does it symbolize by the woman RIDING the beast? It symbolizes the fact that the woman is in CONTROL of the beast and DIRECTING it. Telling it where to go and what to do. And if you check out the study on the whore of Babylon, you will see that it represents the Roman Catholic Church. So although the beast of Revelation 13 also comprises the other nations of world which gave their support and power to the papacy. The main antichrist kingdom which does the LEADING and DIRECTING is the Papacy at the Vatican. And this is the beast who's mark is enforced upon the world. Ok, so now we are getting somewhere. The number of the beast is also the number of A MAN. So we should be able to fit this number 666 with a particular person of the beast. Does the Papal Church of Rome have a leader? Yes! Just as the little horn of Daniel 7 had "eyes like the eyes of a man" who spoke great things against our Most High God. So does this beast of Revelation 13 have a man at the helm who has spoken great pompous words against God Almighty. That man being the Pope. Just take a look at this page to see just some of the pompous words that the Roman Catholic Church speak against God. "Question: Vicarius Filii Dei? What does this mean? Is it a phrase referring to the pope or priest? I have heard that it is inscribed on the pope's hat, or something. Just curious to know what is it." 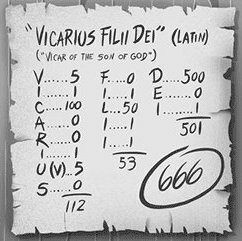 If you convert the name "Vicarius Filii Dei" into Roman numerals, and CALCULATE the total number, you will come to 666! So we have a match for the number 666. It is the number of the beast (The Papal Church of Rome) and more specifically, it's the number of the man who is the leader of the beast system, the Pope! There is also evidence of a Babylonian "solar seal" with 36 numbers on it, representing the different Babylonian "gods" that they worshipped. 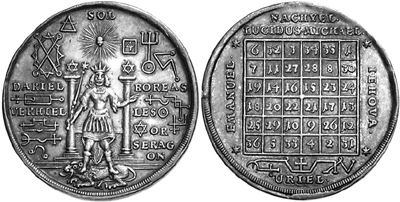 And if you calculate the 36 numbers on this seal, as pictured, adding them together, they come to 666. In this Babylonian system of worship, they had 36 gods, with the sun god being the supreme "father" god that ruled all the other gods. And they assigned the sun god the total number of all these other gods, which was 666. For much more information on this solar seal and Babylonian numbering system, see this site and this site about 666. Now maybe you are thinking what has this got to do with the Roman Catholic Church? Well, it has a lot to do with it, because the Roman Catholic Church adopted many of the Pagan systems and traditions from Babylon. And what is the Roman Catholic Church called in Revelation 17 and 18? BABYLON the Great, the mother of harlots. So we are now dealing with spiritual Babylon. A woman, who represents a church, who has committed fornication with the world and adopted many of the original Babylonian traditions. Please study and learn about the WHORE OF BABYLON to see proof that Babylon the Great HAS to be a professing Christian church. And what about the ultimate? Sun Worship? Was that adopted too? Well, we know that the Catholic Church are largely responsible for changing the Lord's Seventh day sabbath to SUN-day, to keep the Pagans happy. But also, take a look at the following pictures. On the left you will see a Roman Catholic Church procession with a clear image of the sun being held aloft and carried by the priests. 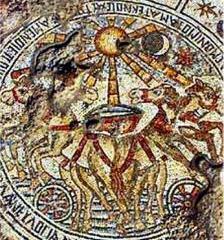 And on the right you will see a very early picture of sun worship. Just look at the image of the sun in both. They are the same! 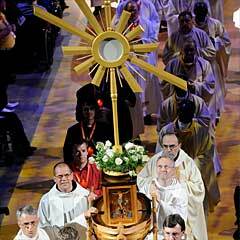 And this is just one of the many images within the Roman Catholic church that are adored, venerated and worshipped. The Roman Catholic Church is full of different "gods" just like ancient Babylon was. There is no doubt that the beast of Revelation 13 is the Papal Church of Rome and the number of the beast 666, points to the Papal Church and more specifically, it points to the leader of that church, the pope!